From the Metro newspaper, March 2008 ,Toronto, Canada. One-and-a-half-year old chihuahua Conan prays with his owner and chief priest Joei Yoshikuni at the Shuri-Kannondo temple in Okinawa, Japan. Yoshikuni said Conan generally goes through his prayer routine without prompting before his morning and evening meals. What a lovely image! I have no doubts that animals perceive very strongly the presence of higher energy levels and they certainly also have an instinct of imitating their owners/companions. 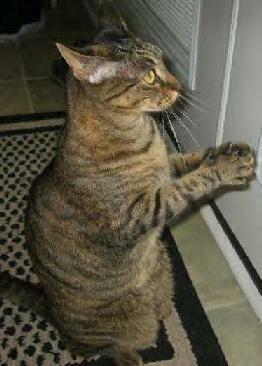 I love the thought that there can be a true communion between animals and humans, I experience this too with my cat. Our pets are more psychic than ourselves I am sure. Enjoyed this post, dear Inda, thank you. 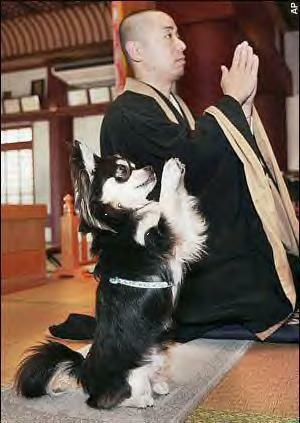 At a Zen Buddhist temple in southern Japan, even the dog prays. 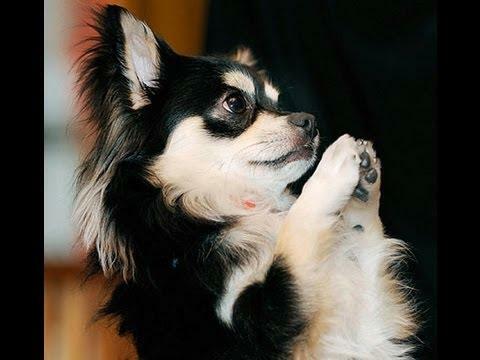 Mimicking his master, priest Joei Yoshikuni, a 1 1/2-year-old black-and-white Chihuahua named Conan joins in the daily prayers at Naha's Shuri Kannondo temple, sitting up on his hind legs and putting his front paws together before the altar. It took him only a few days to learn the motions, and now he is the talk of the town. "Word has spread, and we are getting a lot more tourists," Mr Yoshikuni said Monday. With Conan's help the temple now draws 30 per cent more visitors than before. Yoshikuni said Conan generally goes through his prayer routine at the temple in the capital of Japan's southern Okinawa prefecture (state) without prompting before his morning and evening meals. "I think he saw me doing it all the time and got the idea to do it, too," Yoshikuni said. The priest is now trying to teach him how to meditate. Well, sort of. 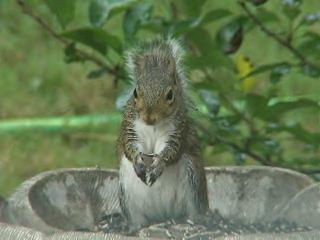 "Basically, I am just trying to get him to sit still while I meditate," he explained. "It's not like we can make him cross his legs." Our pets are more psychic than ourselves I am sure. Thank you yoko for the added information. Thank you Inda. This post really makes my day. The doggie is absolutely wonderful to join his master in prayer. A BIG HUG for Conan. This is a most amazing story and photo of a doggie that I have ever seen. Thank you Inda for sharing this wonderful information. Dogs can be very intelligent animals to train. So sweet this one too! Another one! How absolutely touching is this thought of children praying with their pets! Thank you Margherita for the wonderful pictures. I am always happy when I can come to Givnology. Reading the wonderful posts here is truly a great pleasure for me. Dear Margherita, thank you for the lovely images. These pictures are brilliant. This really makes my day. Thank you very much Margherita for sharing them with us on this very nice post. Dear Margherita, thank you. This image is very lovely. Grandfather, Great Spirit, fill us with light. Teach us to walk the soft earth as relatives to all that live. Thank you for your wonderful additions to this post. I truly am touched by all the lovely images. Your images are absolutely wonderful. I am truly enjoying them. Thank you Inda for starting this amazing thread. Praying for spring to come, so we can go outside and play. Great and Eternal Mystery of Life, Creator of All Things, I give thanks for the beauty You put in every single one of Your creations. This is a really cute picture. This is one of my favorite posts as well.